Colorado tick fever, an acute disease characterized by fever, headache, and severe myalgia, was originally described in the nineteenth century and is now believed to be one of the most common tick-borne viral diseases in the United States. Although hundreds of infections occur annually, the exact number is not known because it is not a reportable disease. It is caused by a coltvirus, a member of the reovirus family. This family also includes the rotaviruses, which are discussed in site. Colorado tick fever has occurred in western and northwestern areas of the United States and western Canada, where the wood tick Dermacentor andersoni is distributed. Ticks acquire the virus by feeding on viremic hosts, and they subsequently transmit the virus in saliva when they feed on a new host. Many ticks have been shown to be infected; however, D andersoni is the predominant vector and the only proven source of human disease. Natural hosts can be one of many mammals, including squirrels, chipmunks, rabbits, and deer. Exposure to ticks is the major risk factor. Human disease is reported during the spring, summer, and fall months. 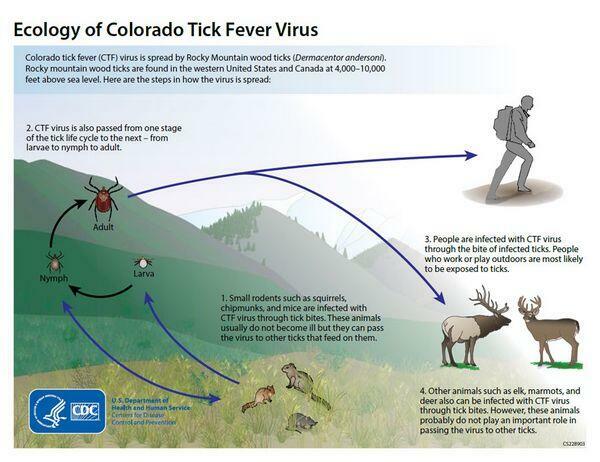 Colorado tick fever is not contagious but has been transmitted by blood transfusion. The coltvirus virion contains double-stranded RNA and is a spherical isohedron measuring 70-85 nm. There is no envelope, and the virus is resistant to lipid solvents. The viral life cycle includes vertebrates, secondary hosts, and invertebrates (insects). Replication occurs in the cytoplasm of various cells of insect and mammalian origin. 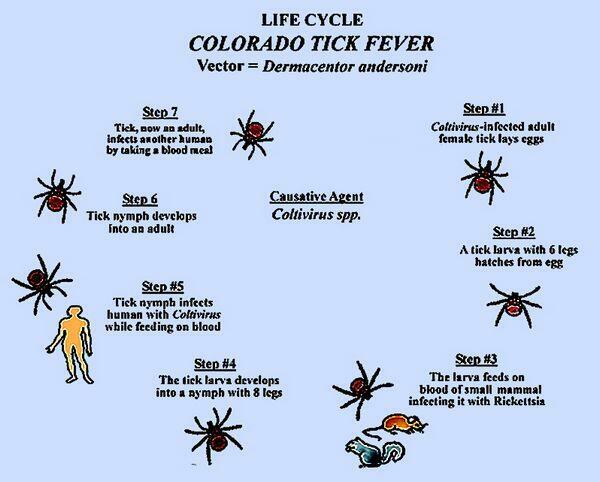 Colorado tick fever virus infects hematopoietic cells without severely damaging them. Viremia therefore can persist for weeks or months even after symptomatic recovery. Acute disease occurs after an incubation period of 3-6 days. Although mild or subclinical infections can occur, most infections are symptomatic with fever, chills, headache, photophobia, myalgia, arthralgia, and lethargy. Neither respiratory nor gastrointestinal symptoms are prominent features. Hemorrhagic disease, confusion, and meningeal signs are unusual but, when they do occur, are more likely in children. Few physical signs are present on examination, but fever, conjunctivitis, lymphadenopathy, hepatosplenomegaly, and maculopapular or petechial rash may be present. A leukopenia involving both neutrophils and lymphocytes is an important hallmark of the disease. Leukocyte counts are generally less than 4,500/mm3, with a relative lymphocytosis. Despite these findings, disease in children and adults is relatively mild, and uncomplicated recovery can be expected. 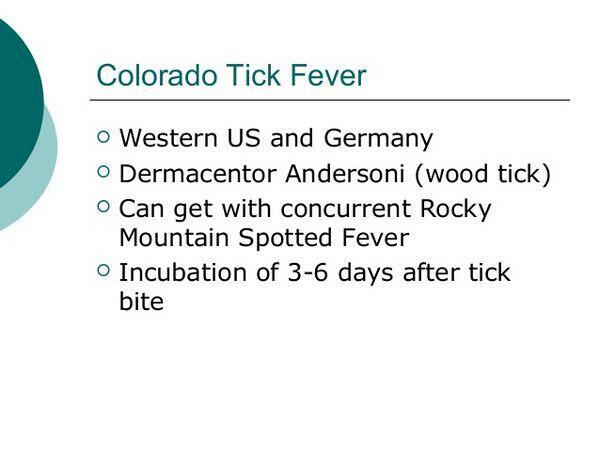 Colorado tick fever must be differentiated from Rocky Mountain spotted fever, a tick-borne bacterial infection characterized by extensive rash and severe systemic illness. There are no serious complications. Specific diagnosis can be made by direct detection of viral antigens, viral isolation, or serologic tests. Because the disease is mild and geographically limited, laboratory tests are not broadly available. Detection of viral antigen in erythrocytes by immunofluorescence staining has been used as a rapid method of diagnosis. Viral isolation can be performed with serum or plasma during the first few days of disease, before the appearance of neutralizing antibody, and later with the blood clot or washed erythrocytes. Viremia is long lasting and isolation is best accomplished by inoculating suckling mice. Infected mice appear ill in 4-5 days, and viral antigen can be detected by immunofluorescence. Colorado tick fever virus can also be adapted to cell culture, but primary isolation in cell culture is not sensitive. A fourfold rise in antibody between the acute and convalescent specimen or the presence of Colorado tick fever virus-specific IgM in either specimen is presumptive evidence of acute or very recent infection. A sharp decline in IgM antibody occurs ~45 days after onset of illness. No specific treatment is available. The disease is generally self-limited, suggesting that supportive care is sufficient. As mentioned, viremia is long lasting, implying that infected patients should not donate blood soon after recovery. Recovery occurs in > 99% of cases. Prevention includes avoiding tick-infested areas, using protective clothing and tick repellents, and removing ticks before they bite. In contrast with tick-borne rickettsial disease, in which prolonged feeding is required for transmission, the virus from the tick's saliva can enter the bloodstream rapidly. A formalinized Colorado tick fever vaccine has been developed and evaluated but is not practical for use by the general public.